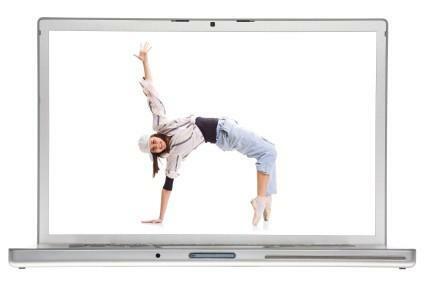 Animated dance steps on your personal computer can help you remember what you have learned if you are currently taking dancing lessons, or inspire you and clarify your ideas if you are a choreographer. The whole concept of animated dance steps may seem odd and out of the ordinary when you are used to taking traditional ballroom dance classes or learning from physical rehearsal or reading a written description of steps. However, using animation has many advantages. First and foremost, it is always beneficial to have good examples of movement if you are a visual learner. If a teacher tells you to step to the right and turn to the left, and you absorb things visually, then you may struggle with the direction provided to you. However, if you can see a sort of "blueprint" of the move on your computer screen, it can help you understand the choreography more clearly. Even if you have a good understanding of how your body should move, animation can help jumpstart your memory before a rehearsal. It is always beneficial to visually review choreography before going to class, and if you have a cartoon representation of two figures going through certain steps, it can save you the trouble of having to relearn something you otherwise wouldn't have forgotten. Finally, as a creator of dance, choreographers often envision things as appearing one way, when they look quite different in reality if dancers execute them. Animated steps can remove some of the mystery, giving you the ability to input what you hope a dance will look like, and see it played out before you pass on the artistry to your students. The relatively new software program called Dance Designer allows choreographers to design dances with animated figures and diagrams. Using these animations, a dancer can map out each and every step of choreography before even entering the studio, reducing stress and confusion at practice. Some dancers have saved literally hours of rehearsal time by taking advantage of these input animations before taking them into the studio. You can learn more about Dance Designer through ChoreoPro's official website. One of the best features of this software is the ability to upload video recordings of your actual dancers in rehearsal, and then convert them into animations so that you can look at the moves, switch things around, and really decide what works best. Another program similar to Dance Designer, but geared more toward partner ballroom dancing, is AniDance. Simply download it onto your computer and you can break down dance moves of various styles including Disco, Latin, Tango, Salsa, and any other type of dance you can think of. You can then edit positions and watch the animated figures dance it out to see if it is what you were envisioning. This can also work as a self-teaching tool if you are hoping to learn some steps that you haven't yet mastered in class or on your own. Finally, for a fun and carefree style of dance such as Square Dancing, check out the Animated Square Dance Patterns Series. While it does not claim to be a teaching tool, it will help you as a supplementary teaching tool to break down various steps like the Ladies Chain Family and Right and Left Thrus. This is all shown to you with an aerial view of square dancers that are color coded to discern who should be standing in what place. These are just a few of the great animation programs out there that can assist you with your dancing. Whether you are a teacher, choreographer, student, or just curious about learning more about the intricacies of any form of dance, these tools are helpful and fun to use too.